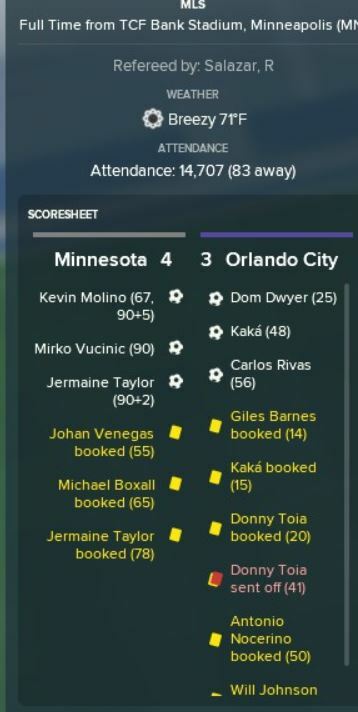 This is part five of an ongoing series replaying Orlando City’s 2017 MLS season in Football Manager 18. Here are links to Parts One, Two, Three, and Four if you want to get caught up. Virtual Orlando City roared into May after a strong April, and for a moment held the top spot in the MLS Supporter’s Shield standings. Everything came undone in Minnesota, as the club faced former manager Adrian Heath and star player Kevin Molino. Despite a red card for Donny Toia, the Lions commanded the first 90 minutes of the match, leading 3-1 going into added time. Then in a series of events that I’ve never seen in decades of playing Football Manager, the Loons scored THREE goals in stoppage time to rob the Lions of all the points. It was absolute madness and Minnesota wrapped up the memorable win 4-3, including two goals for Molino. Adding insult to injury, it seems our old boss really encouraged his new team on to take us to the woodshed in those last few minutes of the game. Virtual or not, it was a gutsy-never-surrender type win that anyone would put an Adrian Heath trademark on. Despite struggling in the North, the Lions continue a strong start to the season on the play of Giles Barnes, Kaka, Dom Dwyer, and Antonio Nocreino. In fact, the May MLS Player of the Month, and the two runners up were all from Orlando City. Virtual Orlando looks more dangerous because Barnes and Nocerino are contributing in massive ways, certainly in bigger ways than they were able to in reality. I’ve thought about this a little, and think it may have something to do with their attributes being a bit higher than they should be due to success in other clubs. This seems to also apply to Kaka. Despite what I witnessed in person, with all three of these players struggling to an extent this season, when it comes to a data driven game and players who have in the past been very highly rated, they aren’t going to be downgraded that dramatically just because they are on a subpar Orlando City squad. One of the big story lines of 2017 in Orlando was Cyle Larin, but not for his on-field play where he had a very pedestrian season. His DUI arrest made headlines without sinking his personal brand too much. Most of the Larin-based headlines involved the forever looming move to Europe that everyone is expecting. The simulation version of events hasn’t played out that way. FM is famous for large clubs constantly threatening to poach your talent at every turn. The game mechanics can be so aggressive at times you’d wish you could file tampering charges. I’ve lost talented teenagers before I knew I had them in my youth system, I’ve lost resurgent veterans who rehabbed their careers only to demand I accept their transfer to sit on the bench in London or Manchester. In this case however, nobody has even declared minor interest in taking the Canadian over the Atlantic. While this is a simulation, it leads me to thinking about the media claims that European teams are lining up for Larin to be more fantasy spread by either Larin’s agent, a league eager to produce European quality players, or a media just hoping they accidently create a story through fiction writing. I’ll keep an eye on the Larin thing, but so far all’s quiet on the European front. 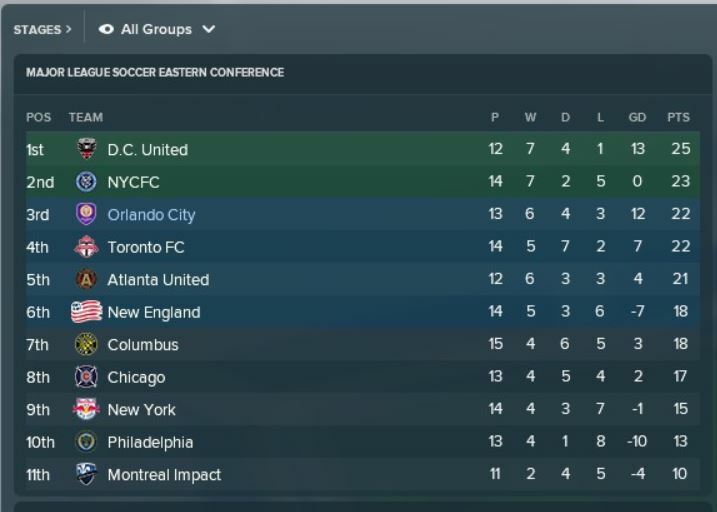 Virtual Orlando stands at third in the East behind a logic defying DC United team. The rest of the standings look about right. Here are the standings at the beginning of June. I hope to have a June update in a few weeks.